The diseases that the Europeans brought to America -- syphilis, smallpox, measles, mumps, and bubonic plague -- caused greater mortality to the native Americans than to the Europeans because they were "virgin soil" diseases to which the Americans had no immunity. In trying to imagine the fear and devastation that a smallpox epidemic must have caused, I first thought of our recent panic over swine flu as a present-day comparison, but the horrifying symptoms of smallpox (high fever and vomiting followed by painful blistering rash and lesions in the nose and mouth) and mortality rate were far worse than anything we contemporary U.S. citizens have seen in our lifetimes except maybe for AIDS. I imagine that the dread that spread through native communities would be more akin to the dread that spread through the AIDS-stricken gay community in the 1980s. Obviously, these native American epidemics were unintentional consequences of the first contact between two previously isolated cultures, but by the 1700s some colonists began to use the diseases to their own advantage. There are several stories of smallpox being used as an early form of biological warfare. One of the best documented instances of the smallpox-on-blankets story is the case of Lord Jeffrey Amherst, commander of British forces in North America during the French and Indian War (1756-'63). In a letter to a military colleague, Amherst wrote, "You will Do well to try to Innoculate the Indians by means of Blanketts, as well as to try Every other method that can serve to Extirpate this Execrable Race." Lord Jeff didn't like Indians very much. I "reduced" the red block twice to create this figure that suggests the shape of the smallpox virus with its outer tubules. Next up is some pretty intensive carving for two more elements for the print, so I probably won't blog again until 2010. Happy New Year! I'm starting work on the central area now. This will be an enlarged view of a smallpox virus (variola). I'll be doing this area with the reduction method using a single block for three different impressions. 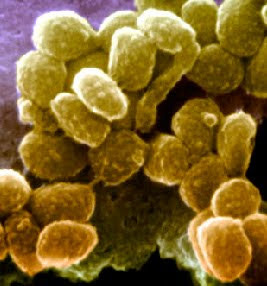 Smallpox is a highly contagious disease that killed an estimated 400,000 Europeans per year during the 18th century and an unknown number in the centuries before. Even as recently as the 20th century, it is estimated that smallpox was responsible for 300–500 million deaths worldwide. After successful vaccination campaigns throughout the 20th century, the WHO certified the eradication of smallpox in December 1979. To this day, smallpox is the only human infectious disease to have been completely eradicated. If you like Joni Mitchell, then you probably noticed that the title of this post is from her song "River." Here's a YouTube video of Joni singing "River" in a live performance at the Royal Albert Hall, nine years before the eradication of smallpox. While I'm working on these prints about the native Americans, I've set up a little display in my studio of various made-for-tourists Indian souvenirs that have come to me over the years. The dolls on the left are Navajo and were purchased by my grandmother in the 1930s. The rest of the items were purchased by me. The pottery is all from various Pueblos in New Mexico where I lived for three years, as is the carved snake. The black pots are from Santa Clara Pueblo, the little hanging pot is from Taos Pueblo, and the beautiful reddish clay pot that you see a partial view of on the right is from Nambe. The basket with lid is from the Great Lakes based Ojibwe nation, and the small Thunderbird basket woven around a bottle (it's a nip-sized liquor bottle) is from the Makah of the Olympic Peninsula in Washington state. I started out this series of prints about the Pilgrims with the question "who were my ancestors and do their thoughts and actions matter anymore?" As I've studied them and read various accounts of their exploits, the question that is with me more often is "Why don't we know this?" The more I learn, the more amazement I feel at how much of the history of my own country is neither taught nor considered relevant. One of the words we use to describe the glossing over or covering up of uncomfortable truths is "whitewashing." Which made today's printing session seem so appropriate. Because I wanted to "screen back" the background so that later on I can overprint something else, I decided to basically whitewash it. I cut some squiggly yersina pestis (plague bacteria) style shapes on the flat block that I started out with and then printed the whole background with a couple of layers of thin white paint. Today I added two more impressions on the Ten Little Nine Little print. These shapes are based on photographs of hepatitis virus particles. I found one photo in particular where the particles seemed to be dyed or colored red and green, so I went with that - a nod to the Christmas season. - The Mashantucket Pequot Museum and Research Center - A tribally owned-and-operated museum complex located in southeastern Connecticut. Lots to explore on the web site as well. To celebrate our ten-year anniversary, we're publishing our third print portfolio, aptly titled "10". This portfolio is limited in edition to 25 and will include prints by invited artist faculty members... It will feature an introductory essay by art historian, Craig Harbison, which will be letterpress printed by Michael Russem of Kat Ran Press. He'll also be printing the title page, colophon and individual artist folios. The container will be designed and built by Sarah Creighton, Bookbinder. We'll be premiering it at the Southern Graphics Council Conference in Philadelphia in March. We'll also be showing it in the Spring at A.P.E. gallery in Northampton. This weekend I printed the two plates I showed you two posts ago. I started by using the plain block to lay in some color just to make a "dirty-looking" under-layer for the background. Ultimately I want this background to be a dull bluish-gray, so what you see in the photo above is a goma-zuri (speckled) sumi ink gray plus a wash of pale yellow to dull things down. Things got a little tricky for me at this stage, because I loved the wood grain that came through. I had no idea that this would happen. I knew that I would lose the grain by overprinting with a different block, and I could have re-carved the "wormy" pattern into the flat block so that I could overprint the same grain, but I'll need this flat block again later, so I decided to continue with my plan. There's still more to be done with the background, but I need to carve a couple of new blocks in order to proceed, so for now I'll let the prints dry out and moisten them again when I have the new blocks ready. In the category of Exhibits I Would Go To If I Lived There, the woodcuts of John Buck are currently showing at Belleview Arts Museum in Washington state. I've seen a few examples of Buck's work in New York and they're large, complex and impressive. There's a nice review of the show on Seattle art critic Regina Hackett's blog Another Bouncing Ball. I read somewhere that Buck eschews traditional woodblock carving tools in favor of ballpoint pens, nails, or even his own fingernails for his complex backgrounds. A man after my own heart -- whatever works. Pacific Northwesters, you have until February 28 to see this show. Please report back if you go! I've got two plates ready to print. The way I was taught to do woodblock was to carve all the blocks I think I'll need, do a few test prints, and make adjustments before printing the edition. I've found that I have more fun if I make it up as I go, though. So even though I usually have a tight sketch and a plan, I prefer to carve, then print, then carve some more and print some more. 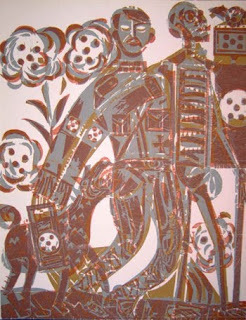 I like to make changes as I go and leave some room to respond to the way a particular block prints. Before the arrival of the Europeans to coastal Massachusetts, Cape Cod and the southeastern portion of the state was occupied by people called the Wampanoag. Wampanoag means "People of the First Light." Unfortunately for them, they were also the "People of the First Contact." In 1617-1619 an epidemic, or perhaps a series of diseases, thought to have been brought by early European explorers spread through coastal Massachusetts, New Hampshire, and southern Maine. Local mortality ranged close to 90%, causing dramatic social change. The population of Plymouth, known to the native Americans as Patuxet, was reduced from over 2000 to almost zero. By the time the Mayflower arrived the village had been completely abandoned. The Mayflower passengers felt that God had prepared this place for them, with its decent harbor, high ground, cleared land and fresh water. No one is sure what the diseases were that raged through the population. Some assume it was small pox, which struck the New England natives again in the 1630s. Others suspect bubonic plague, as there are descriptions of sores on some of the affected individuals. And some even suspect a hepatitis virus. Whatever it was, it was a virgin soil disease to which the Americans had no immunity. Standing in front of that map I let those numbers sink in. Nine out of ten. I learned to count by singing that old minstrel song turned nursery rhyme, "Ten Little Indians." Now I have that melody stuck in my head and I'm picturing seven little, eight little, nine little Indians struck dead by smallpox. This next print I'll be working on is Called Ten Little Nine Little. Counting down. My blog is getting spammed in a big way. Auto-spamming used to be a big problem on Blogger.com, but they figured out how to stop it, much to their credit. This latest spam, however, appears to be "hand made." That is, I suspect that individuals are actually being paid to visit blogs and spam them one by one. I've always liked to keep this blog very open, allowing people to comment anonymously, but I can't stand this spam mucking up my blog so I've turned on "comment moderation" for a while. All this means is that if you comment, your comment won't immediately appear. I'll read it first and then I'll manually allow it to be posted. 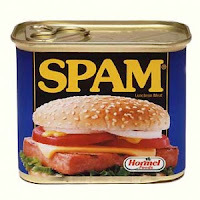 That way I can weed out my friendly spammers. I've seen some interesting articles and links this week. First, an exhibit that came down last week in Boston but can still be seen online, Making connections:Contemporary Cuban Printmaking featured work by 93 artists living in Cuba. Much of that work has been collected by Florence, MA, based studio Red Trillium Press. You can see samples, many of them woodcuts, here. 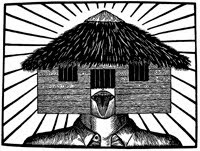 A woodcut artist who opposed militarism and war, [Grieshaber] spent years silenced for his pacifism. He lived and worked in England, France, and Greece before the war, but got deported back to Germany because of his pacifism. In Germany, after 1933, he was only able to create art in secret. Grieshaber did manual labor and delivered newspapers to earn a living during WWII, but still continued to work on his woodcuts. It wasn’t until after the war and after Grieshaber was released from an American internment camp, when the country was desolate of artists and in desperate need of art, that anyone was interested in the work he was doing. Grieshaber's works are powerful meditations on death and culpability. 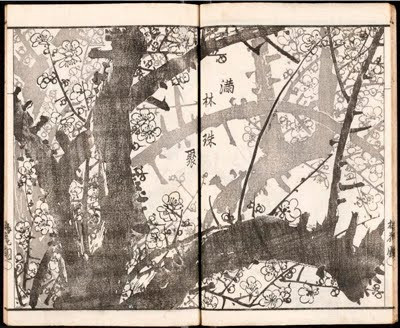 Lately I've been reading Ehon: The Artist And the Book in Japan by Roger Keyes, a book that takes a deep look at the New York Public Library's Spencer Collection. This gorgeous book was recommended to me by gallery owner Beth Cullom during a discussion about artist's books and I'm so glad she turned me on to it. Check out the spread above. That's a woodblock print based on an ink drawing. I find it so beautiful. In spite of the fact that I'll never be able to measure up to that degree of beauty and simplicity, I'm beginning to plan for a possible artist's book. It will be a while before I get to it, as I have several more prints to make in the Pilgrim Series, but true to form I already have a working title: Love Letters From Home.